No, I don’t know what just happened either, apart from after all that Jan Cameron and Graeme Wood ended up buying the Triabunna mill. The details are probably commercial-in-confidence which means either “we don’t know what the hell’s happening either but we’re not letting on” or “we do know, but trust us, you don’t want to”. No doubt we will or won’t find out what shenanigans occurred in due course.Â I’m sure it’s a cracking yarn. 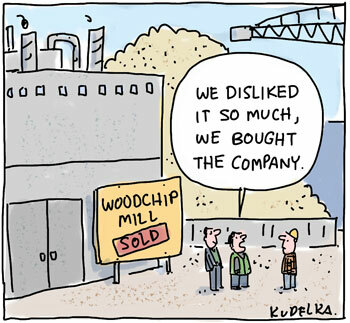 Posted in political cartoons, The Australian and tagged triabunna, woodchip, mill, jan cameron, graeme wood.